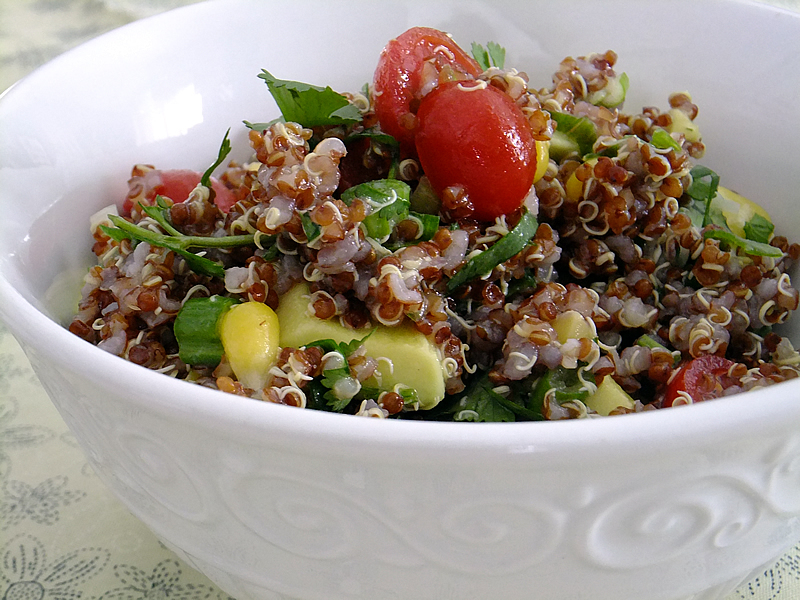 Quinoa (keen-wah) is considered a “superfood” because it contains more protein than any other grain. It’s also a source of complete protein, meaning that it provides all of the essential amino acids. Other grains, such as rice or barley, provide only half of the essential amino acids. Wait a minute, maybe that’s because quinoa is not a grain at all, it’s a seed! Oh well, it’s hyped as a grain because of it’s shared characteristics and similar cooking methods. One thing I do know is that quinoa, in all its crunchy, nutty glory, is delicious and super good for you. I got addicted to this prepared salad at Wegmans over the summer. There’s nothing worse than driving there just for this salad and finding out they don’t have it that day. Wait, yes there is. Driving there to get it and finding it full of brown avocados. Gross! If you want something done right, do it yourself. *There are two cilantro camps: the “‘Oh my god I love it!’ camp” and the “‘Oh my god I hate it!’ camp”. There is literally no in between. If you hate it, try parsley or a bit of mint instead. The hardest part about this is making the quinoa. Those seeds are finicky little buggers. I like to err on the side of caution by using a little less water than recommended. Mushy quinoa is so bad it must go directly in the trash. You can always add more water if it’s dry and cook it longer. 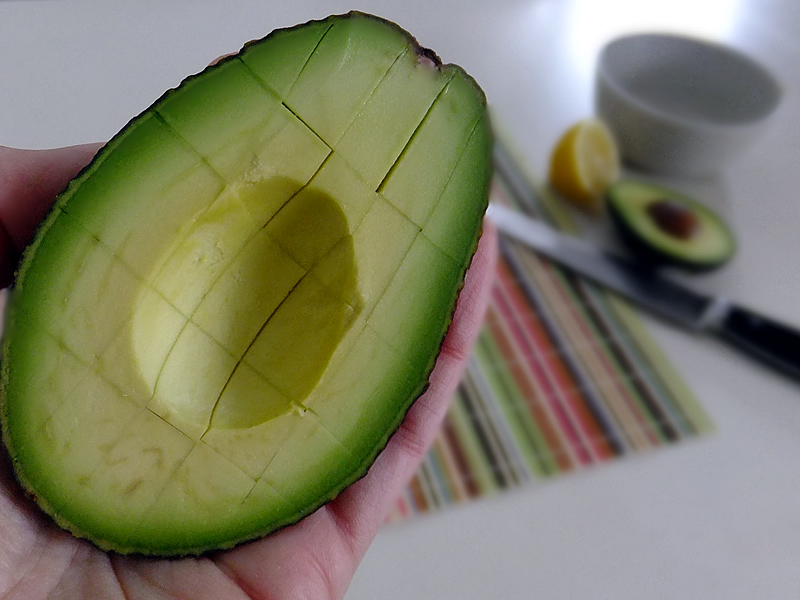 This is the easiest way to slice an avocado. Make horizontal and vertical cuts being careful not to go through the skin and into your fingers! Then just scoop it out. 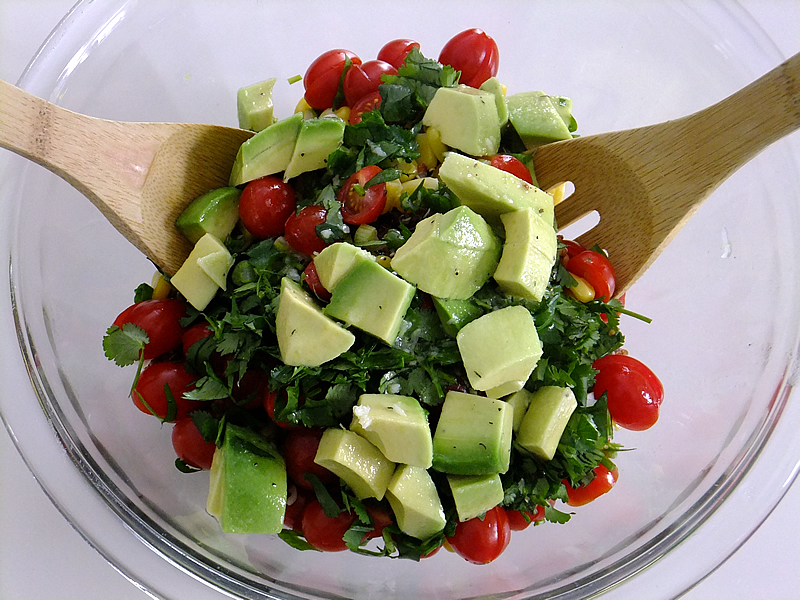 To assemble the salad simply add all of the ingredients to a bowl and gently mix. I like to toss the avocados in the dressing first to give them a good acidic coating. Just say “no” to brown avocados. This looks amazing. I am pinning it to make later! Beautiful photo. I get excited with avocados are involved. This looks delicious! This salad looks both healthy and refreshing! Thank you for sharing this. Allen. I really need to try red quinoa, mainly because it just looks so pretty! Yes, try it! It’s really good and great for you. Glad to see Quinoa getting some attention. I love the stuff. The recipe looks delicious! I totally get the cilantro deal, I like it and my husband hates it! Mushy Quinoa does NOT have to go in the garbage. I don’t have a website, but google quinoa chocolate cake. Thank me later!